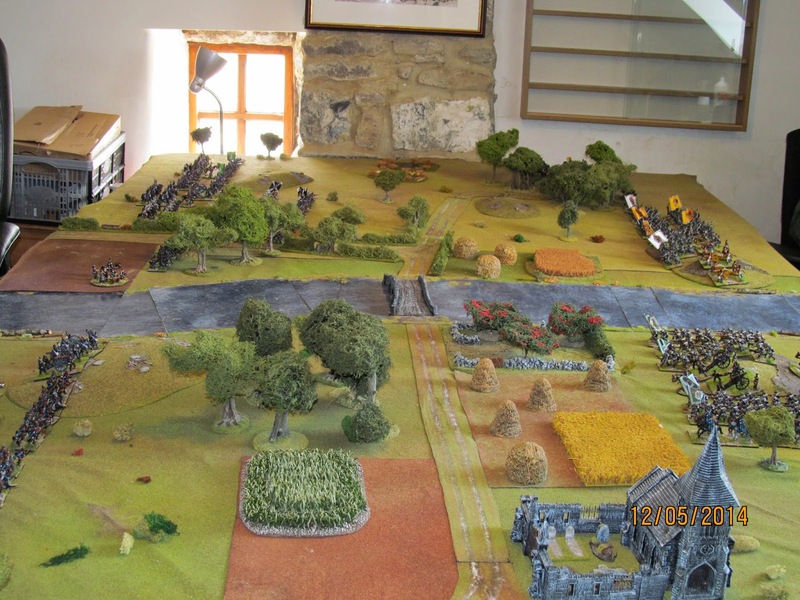 John came up on Friday for a game and I'd decided beforehand to set up an 1866 game using Black Powder to get my Austrians and Prussian on the the table for the first time. Straightforward scenario as there were just the two of us. 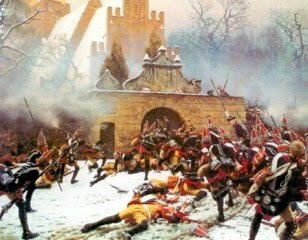 Prussians invading Bohemia and need to gain control of the river crossing in order to facilitate their advance. 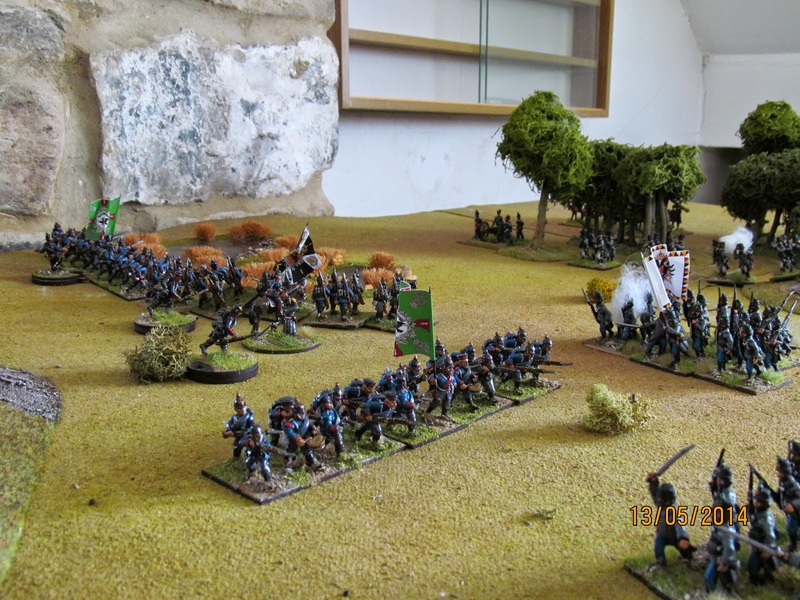 The combined Austrian/Saxon forces have to stop them. 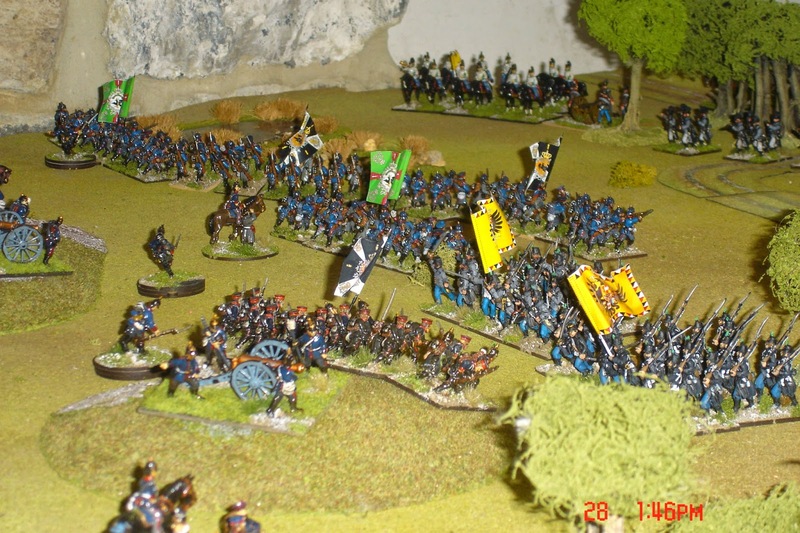 The Prussians fielded three brigades of infantry totalling 13 battalions, a brigade of 2 regiments of cavalry and supporting artillery, one per brigade plus a reserve of 2 batteries. Half the Prussian artillery were 12 pdr smoothbores; the rest were modern Krupp guns. 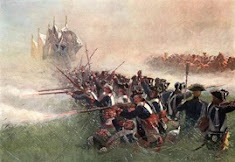 The Prussian infantry were of course armed with the Dreyse Needlegun, which although it had a rapid rate of fire was outraged by the Austrian muzzle loading rifles. 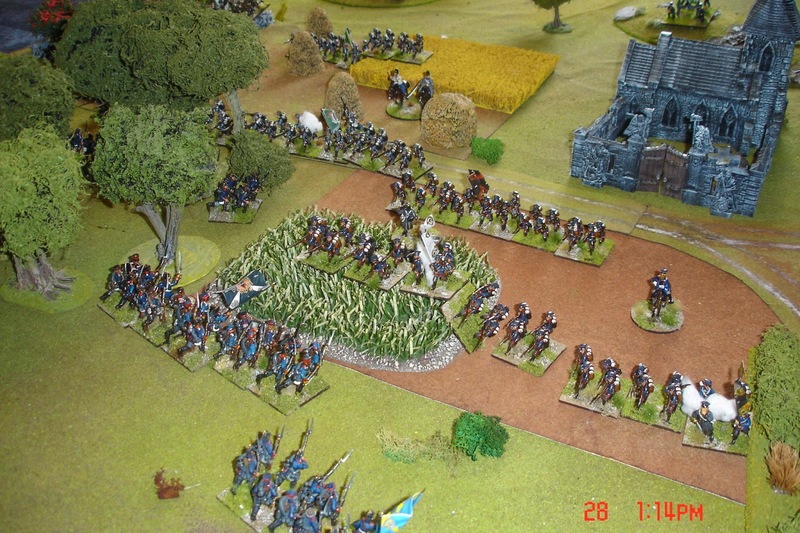 The Austrians fielded a strong brigade of 7 btns of infantry and the Saxons fielded 5 btns. I rather foolishly added a further brigade of Saxons (actually Hesse-Darmstadters masquerading as Saxons) but forgot to balance the game by adding another brigade of Prussians!!!! 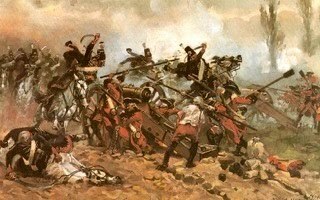 Included in each brigade were a btn of jäger and supporting artillery and the Austrians had an attached unit of hussars. 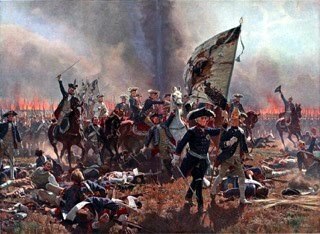 The Austrians also had a brigade of cavalry from their cavalry reserve made up of a unit each of Uhlans and Cuirassiers. 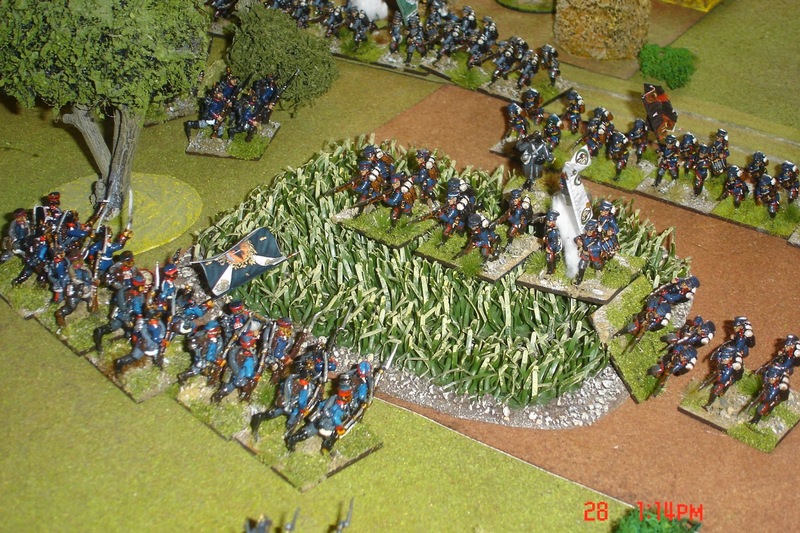 The Saxon infantry had a unit of Reiter attached. All in all I think the forces were reasonably well balanced and if necessary I did have more troops that could be fed into the game should it turn into more of a bloodbath than I expected, assuming I actually remembered! 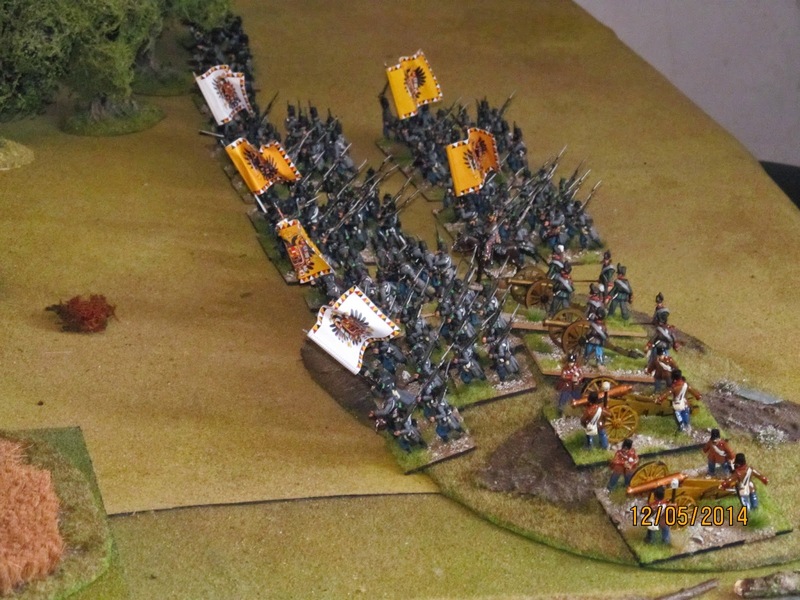 The Austrians had the advantage of much superior artillery and the dubious benefit of more cavalry while the Prussians had a definite edge with their breach loading rifles. I didn't make any changes to the rules as such but did have to create the troop definitions and capabilities from scratch. 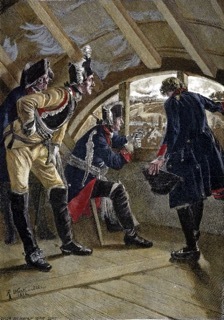 For example, the Austrians favoured costly frontal attacks with assault columns, even in defence! They didn't work (no brainer there) but they repeatedly threw themselves forward in desparate attempts to come to grips with the Prussians. Their artillery was very good so I gave them the sharpshooter rule where they would get to re-roll one miss each turn. I also gave them very slightly more artillery than the formation sizes suggested to reflect that they had 8-gun batteries as opposed to the Prussian (and Saxon) 6-gun ones. 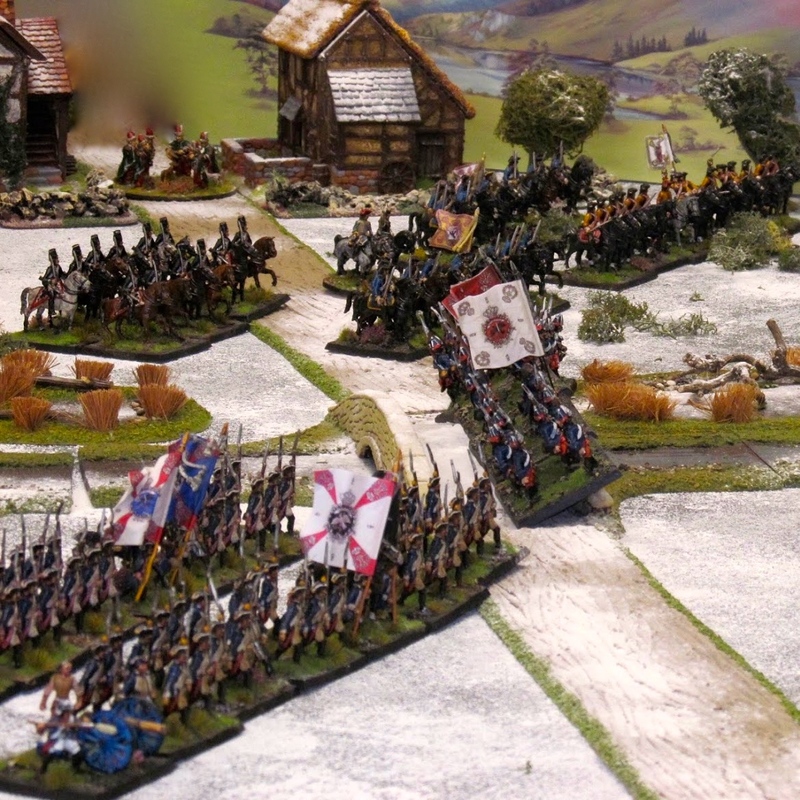 All the Austro-Saxon commanders were rated 8 while the Prussians were 8 with the C-in-C a 9. 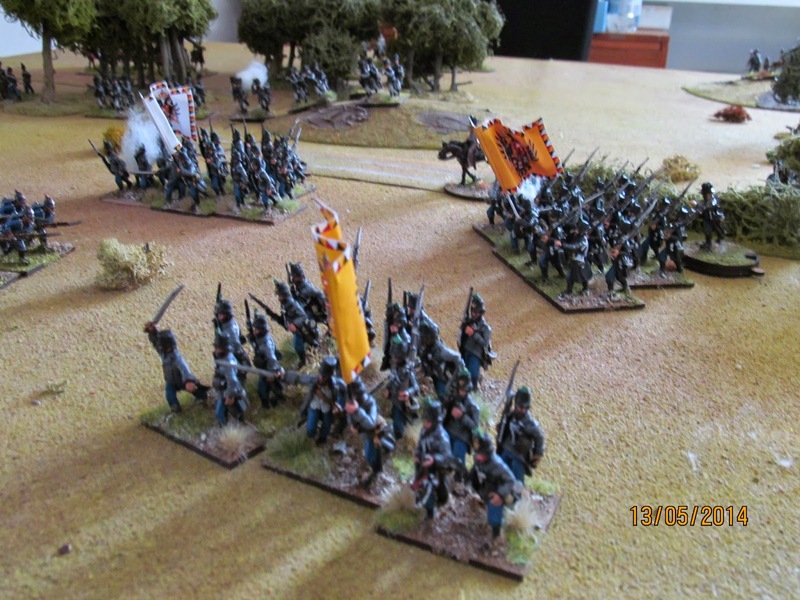 In short, I (the Prussians) buggered it up and made a complete mess of deploying and gaining our objectives. 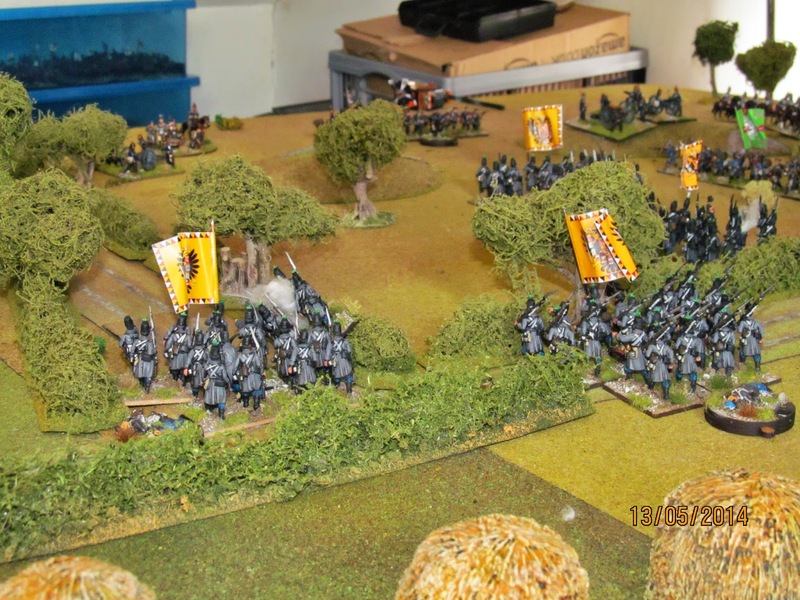 On the right, my sole infantry brigade found itself facing twice its numbers of tough Saxons. 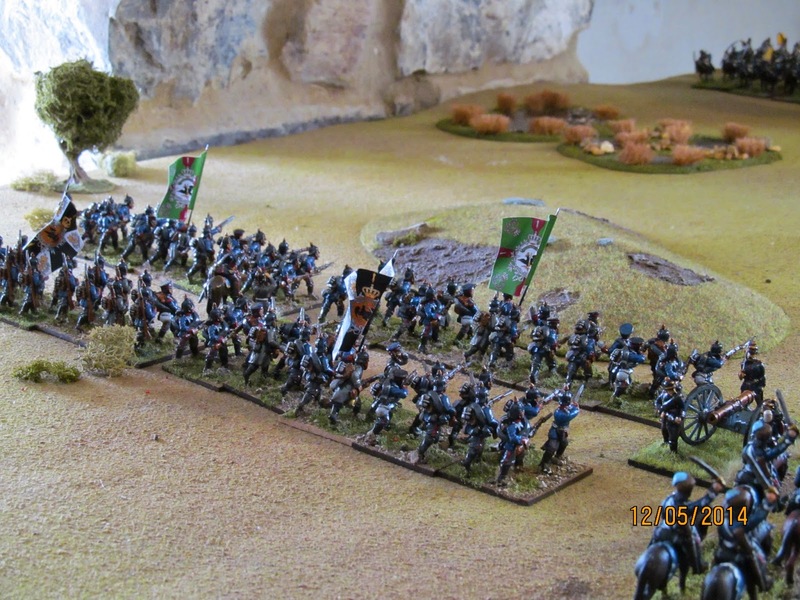 Although they held on for a while, the result was never in doubt and the brigade eventually had to withdraw with half its units shattered. 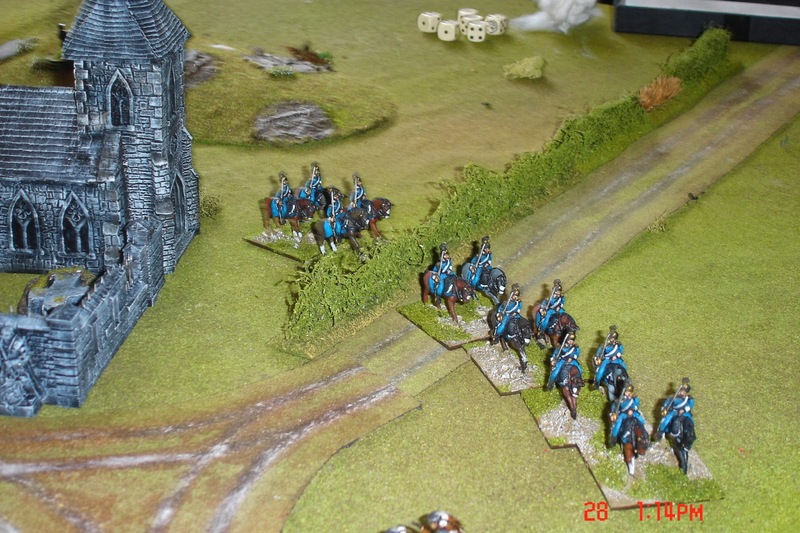 The superiority of their musketry just couldn't cope with the numbers facing them, coupled with the usual run of average to bad saving rolls! 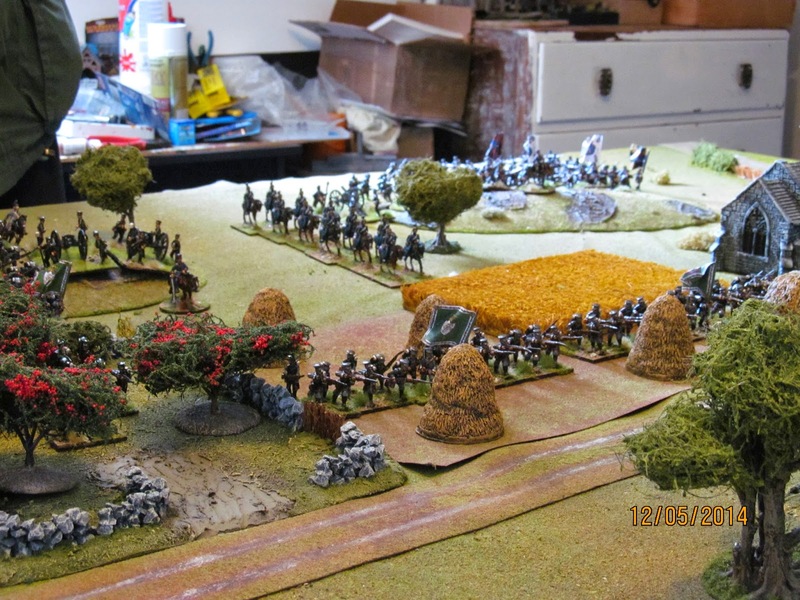 On the left the Prussians made a slow start and were unable to take advantage of their superior firepower due largely to the Austrian long range artillery fire and some amazing saves by John. 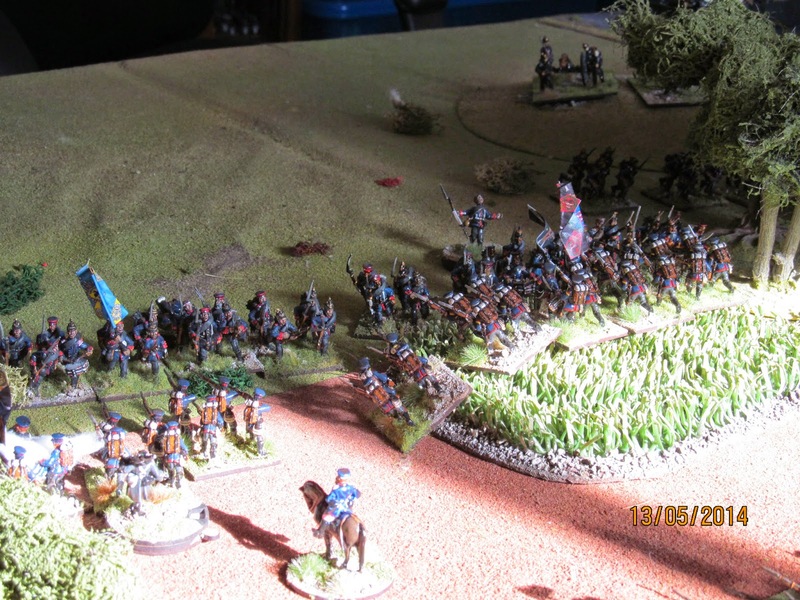 The Austrian hussars did get into contact with one of my units but were predictably driven off. 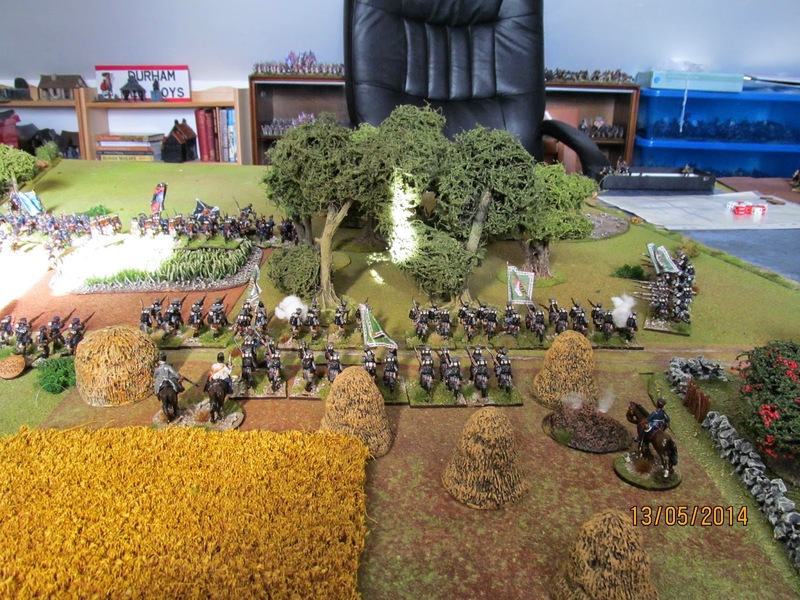 I also managed to persuade the remainder of the Austrian cavalry to avoid launching any further attacks and they lurked behind a wood for most of the game. 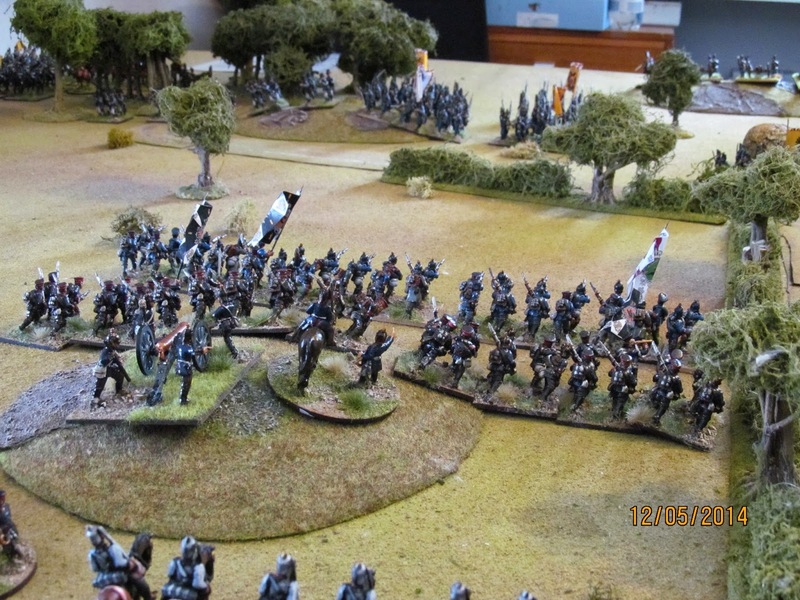 One of my brigades on the left flank was softened up by Austrian artillery and then shattered by their storm columns that against the odds actually made it into contact. In reality i don't think an Austrian storm column ever made it into contact, but if in the game there isn't a chance then what's the point of getting the figures out of the box? With half my brigades broken and nowhere near the objective I threw in the towel. Round 1 to the Austrians. 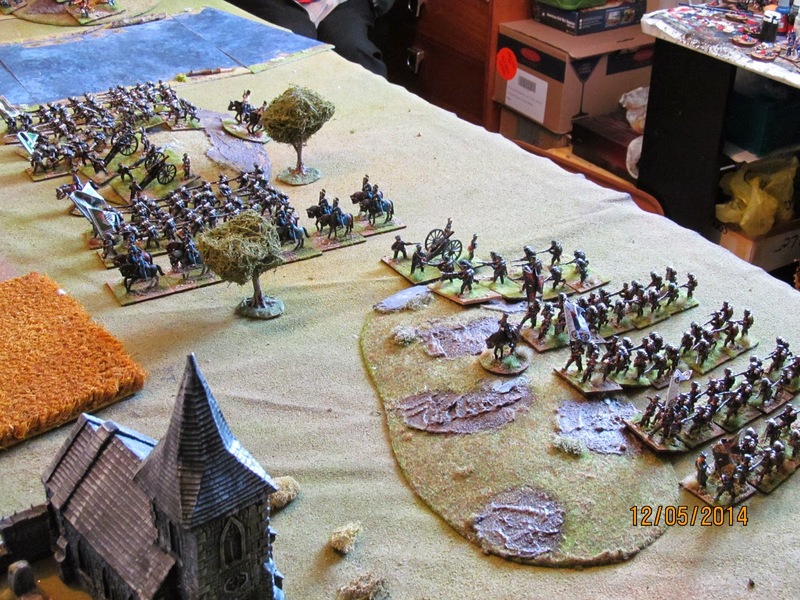 The Prussians will make another attempt 'later in the day', and this time they will get it right as well as remembering to deploy the extra brigade of infantry!!!!!!! Not sure unadulterated BP works for this period or any with 'modern' weapons but having fought the game I know where to make a few adjustments to the troop characteristics to make it feel 'right' without altering the actual game mechanics. Round 2 is later this coming week with a bit of luck...... 'ding!ding! Good looking game and better luck next time! 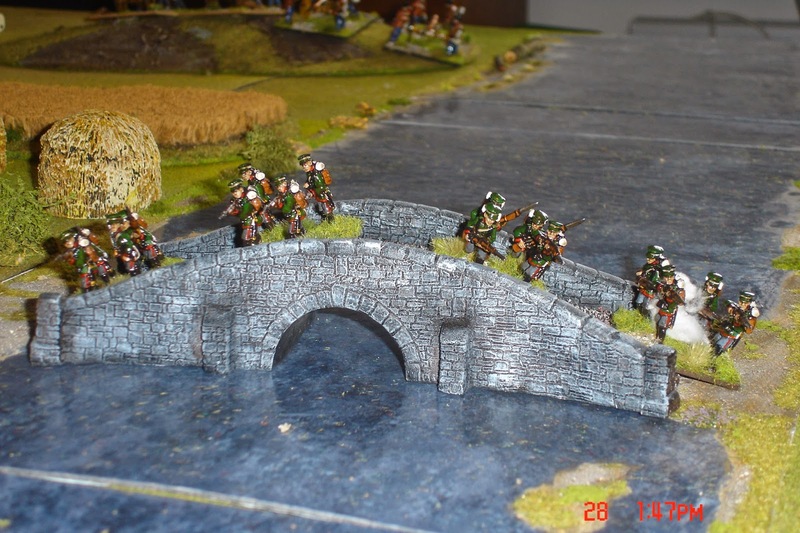 Looks nice, beautiful troops and terrain!